Carlos P. Ramirez, of Planada, California, born on June 7, 1943 in Merced, California, to the late Cecilia and Aurelio Ramirez, passed away at age 75 on November 13, 2018. 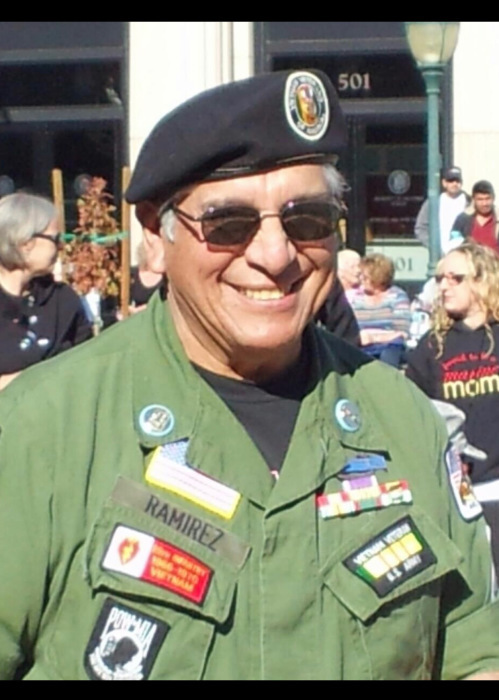 From 1965 to 1966, Carlos served in the Army in the Vietnam War. He was a recipient of the Vietnam Service Medal Purple Heart, Combat Infantrymen Badge, Vietnam Campaign Medal Sharpshooter(Rifle), Sharpshooter(M60MG) and the National Defense Service Medal. He was in the Retail Sales industry at Montgomery Wards as a salesman until retiring in 2001 and in the Retail Sales industry at Home Depot as a salesman until retiring in 2016. Carlos was married to the late Conception M. Ramirez. He was preceded in death by his daughter, Carla P. Ramirez. Carlos is survived by his daughter, Celeste P. Ramos (Jose); granddaughter Carla C. Ramos(Alex); great-grandson Aaron D. Pruneda; and brothers, Henry Ramirez (Koren), Angelo Ramirez (Candie), Adolfo Ramirez (Tina); and sister, Elvira Lopez. He also leaves behind his adored dog, Nala. Carlos had many Nieces, Nephews and Godchildren that he enjoyed spending time with doing various hobbies. Carlos' hobbies included making olives, making and serving menudo on Sundays at the American Legion, a loyal Oakland Raider fan, attending and being a part of all things that involved Veterans, and he enjoyed spending time with family and friends. He was an active member of the American Legion Post 83, VVA, VFW, the Merced Golden Lions Club and a supporter of the Boys and Girls Club of Merced County. Friends and family can pay their respects at the Visitation and Rosary(6:00) service on Tuesday, November 20 from 4:00 to 8:00 p.m. at Ivers & Alcorn Funeral Home - Merced, and on Wednesday, November 21 attend 10am Mass at Our Lady of Mercy Church-21st Street Merced. Burial will follow at the San Joaquin National Cemetery in Santa Nella.